Boston Public Library offers an abundance of author talks and programs across the city’s locations in September, including classes designed to build career skills by the Central Library’s newly renovated Kirstein Business Library and Innovation Center. Visit www.bpl.org/calendar for a complete list. The library’s first Lowell Lecture of 2016 features Michael Patrick MacDonald, who details his memoir All Souls: A Family Story from Southie on Tuesday, September 13, at 6 p.m. in Rabb Hall at the Central Library, located at 700 Boylston Street. Lori Stokes debunks five myths about the Puritans on Wednesday, September 14, at 6 p.m. in the Commonwealth Salon at the Central Library, located at 700 Boylston Street. 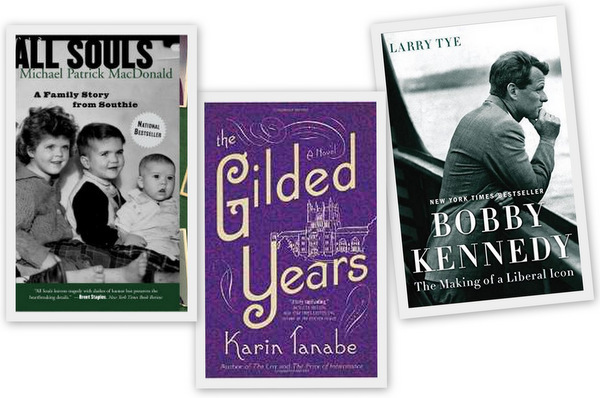 Karin Tanabe speaks about her book The Gilded Years, which tells the story of Anita Hemmings, the first black woman to attend Vassar College by passing as a white woman, on Thursday, September 15, at 6 p.m. in the Commonwealth Salon at the Central Library, located at 700 Boylston Street. Kim Kerrigan and Steven R. Wells discuss Get a Grip on Business Writing: Critical Skills for Success in Today's Workplace and give tips for attendees on Thursday, September 15, at 6:30 p.m. at the West End Branch, located at 151 Cambridge Street. The Friends of the Connolly Branch Library hold their annual book sale on Saturday, September 17, from 10 a.m. – 4 p.m. at 433 Centre Street in Jamaica Plain. Stacy Schiff, author of The Witches: Salem, 1692 examines the legal and social ramifications of the Salem Witch Trials, the truth about witchcraft, the adolescent mind, and how the events of 1692 shaped America’s future. Tuesday, September 20, at 6 p.m. in Rabb Hall at the Central Library, located at 700 Boylston Street. In Bobby Kennedy: The Making of a Liberal Icon, Larry Tye draws upon unpublished memoirs, unreleased government files, and 58 boxes of Bobby’s papers that had been under lock and key for the past forty years to peel away layers of myth and misconception to paint a complete portrait of him on Thursday, September 22, at 6 p.m. in Rabb Hall at the Central Library, located at 700 Boylston Street. Ted Reinstein, a native New Englander and local writer, shares stories from the history of New England and brings to life many of the fights, spats, and arguments that have, in many ways, shaped the region in Wicked Pissed: New England’s Most Famous Feuds. Tuesday, September 27, at 6 p.m. in the Abbey Room at the Central Library, located at 700 Boylston Street. Stephen T. Moskey explores the intersection of wealth, celebrity, politics, gender, and race in Larz and Isabel Anderson: Wealth and Celebrity in the Gilded Age on Wednesday, September 28, at 6 p.m. in the Commonwealth Salon at the Central Library, located at 700 Boylston Street. Gary Gekow: Interview Workshop: Participants role-play typical interview questions and learn how best to answer them in this interactive and informal question and answer session on Tuesday, September 6, at 6 p.m. in The Exchange, located on the Lower Level of the Central Library’s Johnson building at 700 Boylston Street. Web Development Academy Orientation: Ryan Mitchell, author of Web Scraping with Python: Collecting Data from the Modern Web and Instant Web Scraping with Java teaches basic web design from September 12 – November 7 in The Exchange at the Kirstein Business Library & Innovation Center. Classes will meet on Mondays and Wednesdays from 6-8 p.m. (excluding Columbus Day). An orientation session will be held on Wednesday, September 7, at 6 p.m. in the Commonwealth Salon at the Central Library, located at 700 Boylston Street. Attendance at the orientation is required to register for the course. Summer School Series 2: Digital Marketing Strategies: Hosted by General Assembly, this class covers the fundamentals of digital marketing and introduces attendees to the key channels, concepts, and metrics on Thursday, September 8, at 6:30 p.m. in the Commonwealth Salon at the Central Library, located at 700 Boylston Street. Basics of 3D Printing: Students receive an overview of software and equipment available for 3D printing at KBLIC on Thursday, September 8, at 1 or 6 p.m., and on Thursday, September 29, at 1 or 6 p.m. in The Exchange, located on the Lower Level of the Central Library’s Johnson building at 700 Boylston Street. SCORE Small Business Mentoring: Receive free one-hour business mentoring sessions for small business owners or people considering starting a small business on Saturday, September 10, at 1, 2, or 3 p.m. and Saturday, September 24, at 1, 2, or 3 p.m. in The Exchange, located on the Lower Level of the Central Library’s Johnson building at 700 Boylston Street. Preregistration is required; please call 617.565.5591 or visit https://scoreboston.org/KL. Gary Gekow: Interview Workshop Part Two – Behavioral Interviewing: Find out how to answer scenario-based questions with a story-like response using the STAR style of interviewing on Tuesday, September 13, at 6 p.m. in The Exchange, located on the Lower Level of the Central Library’s Johnson building at 700 Boylston Street. Navigating Photoshop: Learn basic techniques to navigate Photoshop, manipulate images, get an introduction to layers, and discover resources for further learning on Thursday, September 15, at 1 or 6 p.m. in The Exchange, located on the Lower Level of the Central Library’s Johnson building at 700 Boylston Street. Gary Gekow: The Importance of LinkedIn: Gekow reviews best practices as they relate to online profile creation and managing one’s account. He also discusses the many additional usages of LinkedIn including the importance of joining groups and getting others to offer testimonials. Tuesday, September 20, at 6 p.m. in The Exchange, located on the Lower Level of the Central Library’s Johnson building at 700 Boylston Street. Create with Photoshop: Receive an overview of specialized tools and brushes for creating and editing images on Thursday, September 22, at 1 or 6 p.m. in The Exchange, located on the Lower Level of the Central Library’s Johnson building at 700 Boylston Street. Budgeting Basics with Google Sheets: Learn how to create an inventory of your monthly expenses using Google Sheets. This workshop will help you keep your budget on track so you can save for future goals on Friday, September 23, at 2:30 p.m. in the Community Learning Center Classroom in the Johnson building on the Mezzanine Level at the Central Library, located at 700 Boylston Street. Gary Gekow: Tell Me about Yourself: In this interactive workshop, learn new-found confidence in how to talk about yourself in interviews, including where to begin and when to end to make a compelling story on Tuesday, September 27, at 6 p.m. in The Exchange, located on the Lower Level of the Central Library’s Johnson building at 700 Boylston Street.